Donald Trump. A name that is in the news all of the time nowadays. Come to Chicago and cross the Michigan Avenue Bridge over the Chicago River and see the Trump Tower, a huge skyscraper, shaped like a bottle in reflective bluish glass with elegant and graceful curves. It WAS a beautiful building. And then Donald Trump decided to put his name on it in letters that are metallic and HUGE. His name screams out, blocking the fine lines of the structure. 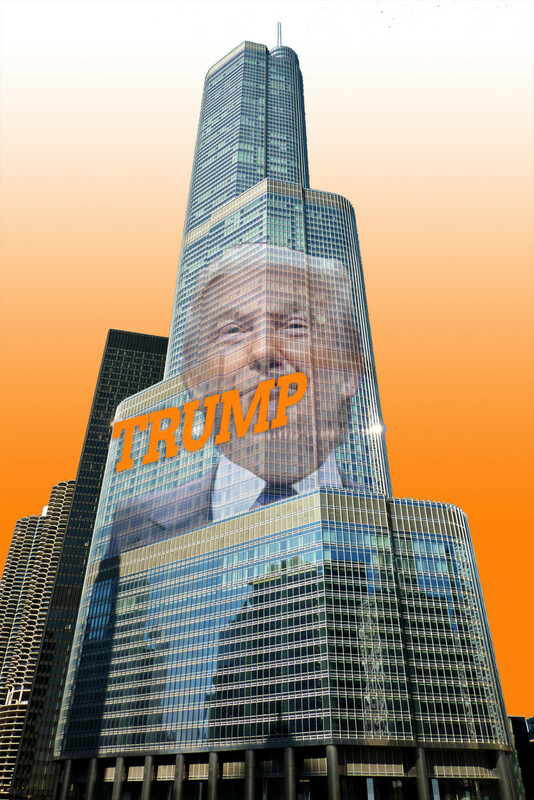 At first, the Trump Tower did not have the name emblazoned on it and people were pleasantly surprised by the good taste of the building. 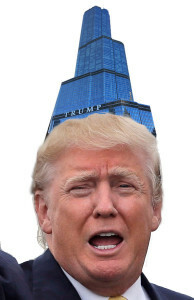 “Wow, we have a new, beautiful 98-story skyscraper in Chicago. That is fantastic for our skyline and for our reputation as a city of architecture” they thought. But then the sign was plastered on the facade, facing the Chicago River, and people were raging mad about it. How does it work if you want to put a sign up on a building like Donald Trump did and is there any way to block him (or someone else) from making it so ugly? There are city laws (called ordinances) that set up the rules for posting signs, for lighting, for garbage cans and for a zillion other things that make a city tick. This week, a group of people decided to “symbolically” throw the Trump Tower in the Chicago River. They are very disturbed by the presidential candidacy of Donald Trump. To illustrate their disapproval, more than 7,ooo people have registered on Facebook to meet on January 29, 2016 and “throw” the Trump Tower into the Chicago River. Find out more here and you can join in the political action!